Making a decent book trailer is a challenge, no doubt about it. But with a few handy iMovie tips and some generous friends you can put together a mini movie of your book with time to spare. iMovie has a good variety of trailer templates to choose from but the trick is finding one that suits the look, feel, content and mood of your book. There’s no use having a sweet, tinkly soundtrack accompanying serious images. Before you start, have a think about the personality of your book and match it to a template that suits. I chose ‘supernatural’ for A Mer-tale because the graphics, font and soundtrack fit its mysterious, underwater science fiction and fantasy crossover. An iMovie template has the advantage of giving you exact place settings for certain types of images – mid shot, action shot, close up. It also tells you how long that image will play for – 2 secs, 9 secs etc. However it’s up to you how you shape the structure of your book trailer so that particular images land at the right place to give the trailer a feeling of building tension. Plus you need to match the images to the building tension in the template’s soundtrack. Placement of images is key. Take time to note down what key moments in the book you’d like to have appear in the book trailer. 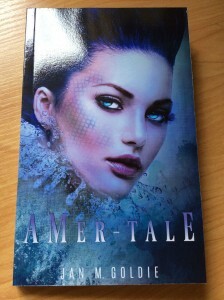 In the A Mer-tale book trailer, I wanted to introduce the idea of an underwater alien species, bring in the main character who is an earth based Mermaid, then show the rush of movement as the action escalates and we’re taken on a crazy mer/alien/human experience. Finding the right images for your book trailer is the most time consuming part of the iMovie book trailer project, but don’t be stingy with your time, because it’s also the most important. Ask friends, ask friends of friends, look through your own image collections, scour wikimedia commons for free images and if you have to, join a stock photo site like dollarphotoclub.com or shutterstock.com for even more choice (at a cost). Make sure the images you are using are legally able to be reproduced and whether it’s friends, family or commons, make sure you give credit where credit is due. iMovie movies and trailers can be jazzed up when you know the tricks. My 10 year old daughter is a whizz at making photos look great. She took pieces of the limited amount of images we had on offer, cropped them, gave them an interesting filter, added an animation and reintroduced them into the story board looking like a totally different shot. I’m happy to share the step by step of how she does this if you’re interested. Comment on the blog and I’ll suss it out for you or post it here! She also took photos of her little sister and included those in the movie. Can you can spot one? At one point in the creation of A Mer-tale book trailer, my daughter and I decided to get fancy with ourselves and used PhotoBooth to create a tropical fish scene. We dressed her in a reptilian mask, superimposed her on the front of the moving tropical fish image and then added an X-ray filter to make it look really weird. Too weird! It looked fake and disrupted the flow of the images we already had. Know when to cut, when you’ve gone too far and trust your intuition when something doesn’t seem quite right. When in doubt, get some feedback from your crowd and edit. Like the book itself, your book trailer takes many drafts, lots of creative energy and a group effort. That’s a wrap! PS: While this post presumes a basic knowledge of iMovie and apple apps, I must admit to never having made an iMovie trailer before. So know that even the clueless among you can have a go. Although I do recommend the advice of a techie 10 year old if possible! Also, I’m aware a professionally produced trailer would look quite different, but we’re pretty pleased with our amateur efforts for now. Wow, this looks really awesome considering you had little to no budget! Super creative and definitely makes you want to read the book!